I made Small Boy another pair of shorts. This was the fabric he first picked from my stash. It's by Cloud 9 and is from the Small World collection, designed by Rae Hoekstra and it's a really fine organic cotton cord. I love it. I bought it from John Lewis at the same time as I bought the fabric for this cushion. Is it ridiculously childish to admit that I was thrilled when Rae herself commented "LOVE" when I posted the below photo on IG this week? I have learned recently that my memory plays tricks on me - or perhaps the staff at the cutting table do - and I have a number of lengths of fabric that are not nearly as long as I thought they were. This is one of them. I could have sworn I had 1.5m of this but it turned out I only had 0.8m. Odd length, so either I bought a metre and it shrunk significantly during pre wash, or maybe this was all they had left. The latter rings a bit of a bell. The original plan was to make trousers for Baby Boy with this, but I never got round to it. Somehow I couldn't imagine them as shorts and I didn't know what else to make. I thought the print would be a bit too babyish for Small Boy, but he decided otherwise and actually his vision was spot on. The fabric is fabulous as shorts. There's a pattern matched back pocket in there somewhere, I swear. The pattern is the Sunny Day shorts again, pretty much made as last time. This time I used one pattern piece for the pocket facing, and I did no top stitching, other than at the pocket opening. I also only did one back pocket and the drafted one piece waistband. This all made for a much faster make. The front pocket lining is recycled from one of my husband's shirts. A nice touch having Daddy's shirt in there, and he was proudly showing that off to his Granny today. I pattern matched the pockets front and back, but that was all. There wasn't enough fabric to do any more. The waistband is pieced for the same reason, but it all looks fine. You need to take my word for the pattern matching, as I have no flat photos. These shorts are either on him or in the washing machine. I'm really happy with these. The colours are so vibrant and although I worried that they might not go with many of his t-shirts, he has proudly been rocking them with an orange Star Wars t-shirt. Colour clashing and print mixing FTW. I guess you might need to be 6 to pull off all the colours. No posey shots this time. These photos were taken on my iphone at Hoggenfield Loch in Glasgow, which is near where my Mother in Law lives. My sister in law is over from New York at the moment so it was nice to see the cousins catch up and play so nicely with each other. Small Boy is in desperate need of some shorts. Most of the shorts he is currently wearing are age 3-4, and he turned 6 last month. To be honest, they do still fit, but I felt that he probably was due some new ones. We had a look through my stash, and he chose a fabric. This is not the fabric he chose. The pattern required a few changes to meet his specifications and I wanted to make a wearable muslin pair to make sure I hadn't messed it up. And then I kind of got carried away with details. I didn't have time to make both pairs before we went on holiday. The pattern is the free Oliver and S Sunny Day Shorts, which I've made before as PJs for both boys. They are a very basic, elasticated waist pattern. The changes I made were to lengthen them to below knee length, and to add front and back pockets. The back pockets are patch pockets and I copied the size from another pair of shorts, changing the shape slightly. For the front pockets, I drafted pocket pieces and bags and made it slightly more challenging by adding a 2 piece facing - I don't know the proper name for this, sorry. It's like the pockets you get in jeans, where the exposed top part of the facing is denim, but the lower portion of the same piece is the pocket lining. Do you know what I mean? I did this because by then I realised I had just enough of this denim for the shorts, which I knew would be too bulky for a full pocket facing. The denim is left over from this Inari dress, and I had to cut it all on the cross grain to fit it in. The pockets and waist band facing (yeah, I "drafted" that too, again to cut down on bulk) are made from chambray left over from my midi skirt. As I was cutting it, I was thinking it was a pity I didn't have any cool boyish fabric to use, when I came up with the idea of letting him design them himself. I cut the pieces and then let him draw on them with fabric pen. Of course I forgot to tell him which way up the pieces went, so some of the are now on their sides, but that doesn't matter too much. For info, each piece is themed. We have Tom & Jerry, Star Wars, Edinburgh Zoo and Dragons of Berk. The waistband says his name and then From Mummy and Daddy, Thank You. I finally managed to use the selvedge on this denim, on the back pockets and I sewed them on wrong side out for fun. All topstitching is done in turquoise thread, although as it's normal thread it's pretty subtle, which is a shame, because it's pretty good! I did bar tacks at the pockets to strengthen them, which turned out well. I also did a fake fly, which I free handed, because without it, the shorts looked a bit meh. It's subtle, but I think it makes them. The fit is quite a bit baggier than he usually wears, but it works. I could slim the legs down, but I'd also need to start fiddling around with the crotch curve and I'm not prepared to do that for boy's shorts. The thing about boys is that they grow, so any changes I make, I'll only have to make again in a year or so. It would be easier just to buy a different pattern. The boy is delighted with these and I am too. He wore them 3 days straight on holiday, where these photos were taken. We went to Dunoon on the West of Scotland for a week, and these were taken at Inverary Jail, where we spent a day. He is wearing the shorts with his birthday tee, which I have realised I haven't blogged. I didn't make the tee - it's M&S - but I did the stormtrooper stencil using my usual method. I think birthday tees are becoming a tradition. This one I made in good time, so the ink would have plenty of time to cure. I found the stencil on Pinterest, here. He also loves this. Double win!!! He takes his modelling very seriously. To a point. And then his brother wanted to join in. Coincidentally, he was wearing his Milk t-shirt under that fleece! Home-stencilled tees FTW! Cuties steal my heart every time! The "more chambray" and the buttons were for my recent chambray midi skirt, and have since been consumed (3 buttons left!). The pleated chiffon was a complete impulse buy, and when you will see it (below) you will realise why. I have no need for it, but it fills my heart with such joy it was worth the expense. It will become a midi skirt once I source an affordable lining fabric that is not sweaty acetate. To justify the cost of shipping from Portugal, and because the more you order from the Sweet Mercerie, the less the shipping costs (nope, I don't get it either, but I'm enjoying it for now. I'm sure that will change once we are ex-EU), I bought more of the chambray that I used for my Scout dress. My plans for it are lightweight summer trousers (not that the weather indicates they will ever be worn) and shorts for either me (see previous parenthetical statement) or Small Boy, who just turned 6 and is still wearing shorts that are aged 3-4, poor neglected skinny soul. Summer hols means more casual clothes requirements. Pleated chiffon of joy. IRL it's a glorious emerald green. Given that I've been freaking out recently about the amount of stuff that has accumulated in our house (SO much crap excellent work home from school last week, plus everyone apart from me has had birthdays recently), I feel it's a bit rich to be buying more fabric, so I am back on the wagon. No more fabric until I've sewn up some a good amount of what I have. Shall we say 4 items as a completely arbitrary target? Plus, as I'm also recording what I'm spending on RTW, I know I spent over £300 on clothes last month! Totally abnormal for me and actually very embarrassing, but that does include new prescription lenses for my sunnies, trainers, a new swimsuit, a rain coat and a denim jacket (#typicalscottishsummerwear). Oh, and my car is in for a service this week. I have no money to spend on fabric because I spent it all already! Since I've been doing this for 6 months now, I thought I'd do a quick summary of the year so far. So my average spend is the same as my rough budget, however given that in Jan I said I wasn't going to buy as much fabric as previously, I've failed pretty spectacularly, haven't I?! Time for those press ups. I suspect that the only way I'm ever going to spend absolutely nothing is to remove myself from all social media and email lists. It wouldn't be enough to simply unfollow the fabric shops, as the inspiration from others is as much a trigger as anything else. But that simply isn't going to happen, because I love blogs and IG and the people too much. I have some firm plans in my head of what I want to sew, so I just need to ensure that I stick to them and don't get distracted. Easier said than done, I think! Like most people, I feel like I need to address the recent British vote to leave the EU. I am refusing to use the term “Brexit” unless absolutely necessary simply because it’s a stupid word. In short, I feel disappointed, sad, scared, sick, anxious, powerless, furious and embarrassed in equal measure. I feel like the times when I was under threat of redundancy, or the times I was dumped by a boyfriend: you wake up in the morning and for seconds everything is OK, and then reality comes crashing in and you have a sort of sickness lump sitting in your stomach for the rest of the day. I know some bloggers have written that to talk about sewing during these times feels frivolous or trite. They are possibly right, but life does need to go on, and sewing has helped me enormously in some difficult periods in my life, and so it shall again. It’s that ability to concentrate on something to switch off the chattering worry in my mind. And to get something pretty at the end of it! To that end, on to the fluffy stuff. The idea for a chambray midi skirt came from this one byElena. I initially thought I’d use the Colette Zinnia, which I already own but have never made, but when I dug out the pattern, I realised it wasn’t quite what I had in mind. I liked the pockets of Elena’s, and although I wanted gathering (Elena’s is pleated), I didn’t want as much as the Zinnia gives. And so I decided to hack the Megan Nielsen Kelly instead, to give me my perfect skirt. In short, I added more volume to the top of the pattern within the pleats, so I’d have more gathering than the skirt would otherwise have had (yeah, I know I said I didn’t want too much gathering, but this tutorial made me think that if I didn’t add more volume, then it wouldn’t be gathered enough! Fickle? Not me, nope. No way), and I then slashed and spread the bottom part of the skirt to provide more of an A line silhouette, and added length to make the pattern midi. This sounds scarier than it was. If anyone is interested, I can attempt a tutorial for how I did this, but I basically used this tutorial get the logic, and then applied that to the skirt. Rather bravely, I decided to forgo a muslin and just cut straight into my fabric, a light coloured chambray from Fabric Alice on ebay (now out of stock). The fabric has a lovely weave and a beautiful drape. It’s much nicer than the chambray I used for my shirt dress last year, but it does have quite a few flaws and it seems to snag pretty easily. It also creases badly as its 100% cotton. The pockets are made from the same bird print voile as the pockets in this dress. Bird pockets FTW. 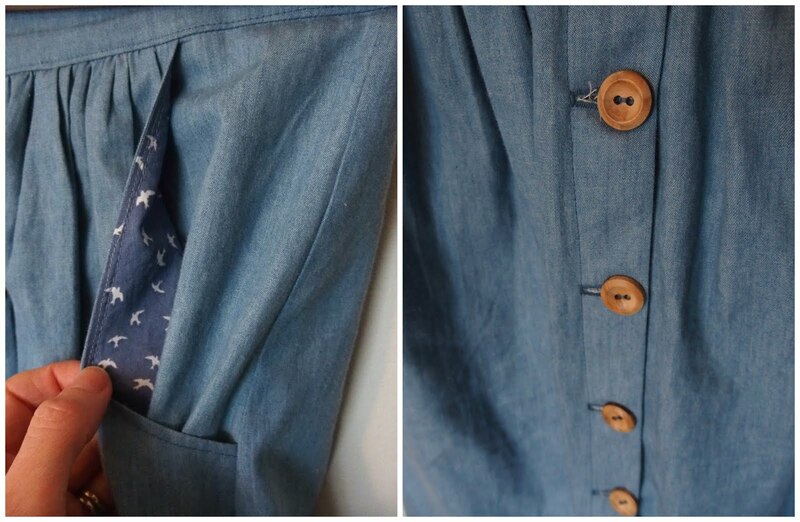 Pocket lining and button details. I kind of made up the order of sewing as I went along, as I wanted to change the construction of the front. The Kelly pattern has you fold and top stitch the button placket and then turn up the bottom hem. This is fine, but on my red one, the hem pokes out at the side of the button placket – a result either of inaccurate cutting/pressing or of the presser foot pushing the top layer of fabric through quicker than the feed dogs are pushing the bottom layer. I wanted to avoid that, as it bugs me on the red one, so, instead I employed the technique described here, which results in a clean finished placket edge. As I was making it up as I went along, there were a few things I didn’t consider, and as a result had to unpick quite a few things. I unpicked my hem topstitching on one side 3 times, but I am pretty happy with it now. I also enjoyed the process of having to think things through, and anticipate what I would need to do next at each stage. Another change I made was to draft a hem facing. This wasn’t part of my initial plan. I used this pattern to determine how much width and length to add to the pattern pieces, as I like how the skirt sits on this, and I find it to be a flattering length. I extended it to keep the deep hem that the Kelly is drafted to have (2 inches/6cm), however when I tried the skirt on before hemming, I really liked the longer length. As I didn’t want to use a narrow hem, I attempted a faced hem instead. I had never used a faced hem before, but approached it like a neckline facing. The only issue was that I forgot to add seam allowance to the bottom of the facing, so it ended up being narrower than intended, but I still think it worked pretty well. It might be a little too heavy for this fabric, as it wants to stick out a bit (like the effect of horsehair braid, but to a lesser extent), but it certainly made hemming on a curve much easier. I would definitely use this technique in future. To counter the longer, potentially frumpy length, I used the button placement for the original Kelly pattern, meaning they stop a good 13"/33cm before the hem and thus flashing a bit of leg as I walk. Somehow I managed to make my button placket narrower than intended. It’s certainly narrower than my red version, and as a result I had to offset my button holes, so they weren’t too close to the edge. I then in turn, had to offset my buttons so it sits properly when closed, as I did horizontal button holes. I think it looks OK though. The buttons themselves were also from ebay, and are made from olive wood. They are exactly what I wanted. I just hope they wash OK. Although my face in these photos would lead you to believe otherwise, I absolutely love the finished skirt. It came out exactly as I had envisioned. Exactly! And I kind of did it all myself! If I were to nitpick I’d say I could have got away with adding slightly less volume to the gathers at the front of the skirt, and my topstitching could be better, but they do not take away from the skirt one bit. I'm sure this is probably caused by some kind of pattern adustment error, but I actually love that in some photos it looks like culottes. 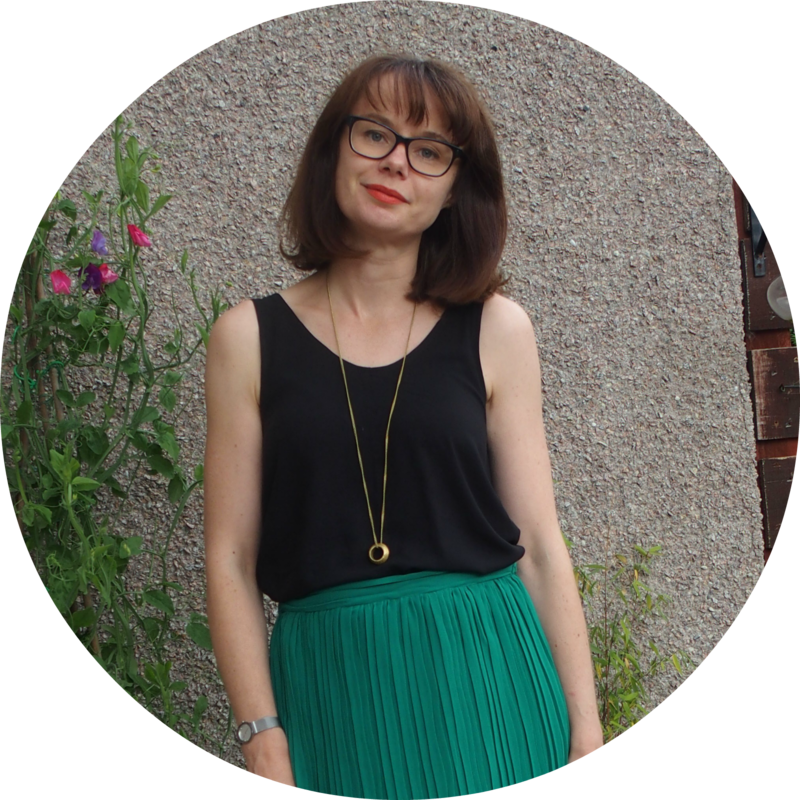 This make was a direct result of my MMM summary – building more me made outfits, by sewing more, versatile bottoms. This fits the bill perfectly. With Lottas it rocks a bit more of a 70’s vibe, but with white trainers it becomes much more modern. It works with a blouse for work, and with a t-shirt for weekends (ironically RTW in these photos). I am wearing it as I type with trainers and a Belle & Sebastian tee! I am now forcibly having to stop myself from making all the things in chambray because it’s my favourite!!! I've been doing some tidying up on my blog today. I was working through changing and removing a lot of labels, because I have tons of the things and end up using them inconsistently. However, once done, I noticed that a number of old posts have published as if they were new. I have managed to fix it, although I've had to guesstimate roughly when the post was originally published, which is just annoying. In the meantime though, your blog reader of choice may have filled up with some out of date posts. Apologies if that's the case. Blogger also managed to publish a post that I was still writing. Luckily I was able to change that back to draft, as I don't yet have photos for it. Gah! Bloody blog hosts and bloody technology!!! !